Bars & Restaurants | Photodam.nl. The photoblog, live from Amsterdam. There are plenty places to get food & beverage in Amsterdam. But: what is the nicest, coziest or best valued place to be or to experience? I mean, no tourist-food, no exceptional high prices because you are a tourist, and so on, just friendly waiters and bar staff and good and well-priced. And, of course, where are the typical ‘Brown-Amsterdam-Bars’ and how do you participate in the real Amsterdam-feeling? This is something you have to experience if you visit Amsterdam! I’ve made a selection of nice and good places in Amsterdam. Enjoy your stay at one of these places! Don’t forget to mention my website! 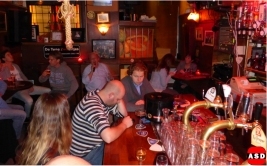 A typical Amsterdam bar. ‘Bolle Jan’ his son is the famous René Froger. Nice barwomen, good-valued beer prices. Dutch (live)music. A place in the citycentre you have to visit at a stay in Amsterdam! One of the better known ‘Jordaan’-cafés with typical party music & every sundayafternoon live music (by a accordionplayer or other artist) and sing-along festivities. Caters mainly to a local public on weekdays, but during the weekend an enthusiastic crowd sings along to old songs from the Jordaan, typical dutch torch and an occasional opera piece. Well, every night is worth a visit and a singalong-night at the 2 Zwaantjes! The bar has a canalside terrace. Say hello from me to ‘Trees’ plz! A pleasant and typical dutch stay in the most hospitable café of Amsterdam: The 2 Swans! Good staff and the locals can be found here. A lot of drinks, nice prices. A typical Brown bar at the ‘Jordaan’, one of the parts you have to visit in Amsterdam. It’s only a fifteen-minute-walk from Dam square to here, so nice to do! Good staff and the local people and students can be found here. Good food and drinks, nice prices too. Cafe Daalder is at one of the oldest parts of Amsterdam and a real ‘JORDANEES’ bar with a nice card and a good cup of coffee. Nice place to rest when you’re at your ‘walking tour through the Jordaan’. Highly recomended! Friendly staff, newspapers and enough ‘domestic’ people to talk with. A typical Dutch cafe at ‘the end of Amsterdam’. It’s at the border with Amstelveen. The ‘Saté’ is the best of Amsterdam but there is more at the good menucard. Every thursday-, friday- & saturdaynight “Club 1890”. Good music, nice people and several times parties with live artists. You need a cab to get there. The biggest beer collection! 18 beers on draught and around 200 different brands on bottle. Monthly changing brands on draught. Sorry, no Heineken! A real ‘cheapo’ cafe/restaturant. (eetcafe). Not a big menucard but nice real ‘Dutch’ food like ‘Stamppot’ and ‘Snert’. The prices: for ± € 15.00 you are really filled up, with 2 or 3 courses and drinks. A lot of students do eat here daily! It’s an old warehouse in the middle of the ‘Jordaan’ with a intriguing walldrawing. ShangHaiNoodle is located next to the V&D at Rokin 152, near Rembrandtplein in Amsterdam. Not a big menucard but a typical light Eastern dish. Noodlesoup, Dim Sum, Salad and much more! The famous Johannes van Dam, a foodcritic of the newspaper ‘Het Parool’, was here and rewarded it with an 8! Great restaurant. Easternstyle food & cheap. Turkish delights restaurant Papatya is next to the famous ‘Jordaan’, 10 minutes walk from the Central Station. A good menucard, with a lot of Turkish specialities. Great chef, nice staff! No reservation needed but it’s a small restaurant (36 seats only) so be in time there! Great restaurant. Remember: Original Turkish food can be spicey! A real Dutch ‘Eetsalon’ (sandwich-restaurant). Established in 1945 and it’s still the same: the food is still fresh, the staff is still friendly and the audience…! Take away the famous “Van Dobben Croquet” or eat it in with a glass of milk at one of the few tables in the restaurant. Good food, nice prices, friendly people. Manneken Pis is the best Vlamisch chips-bakkery, choosen by a jury from ‘Het Parool’ newspaper. Over 20 sorts of sauces. Drinks to take away too.